Translating hymns is no small feat. This is what I’ve concluded after making a first attempt at translating German poetry. Besides conveying the sense of the text, you have to put into metrical form, ideally preserving the meter and rhyme of the original, and do it in a way that sounds good. So I’ve really come to appreciate the work of Catherine Winkworth (1827-1878). She was a prolific translator of German chorales, including “Praise to the Lord, the Almighty” and “Now thank we all our God.” The accounts of her life that I’ve found so far are all rather brief, but all state unequivocally that she did more than anyone to bring the German chorale tradition to English-speaking churches, and that her translations are the most widely used of any from the German. She was an educated woman who, in addition to her translation work, advocated for higher education for women. My guess is that her family was pretty well connected, since, according to one account, it was the German ambassador to England who introduced her to German hymnody. She published her first collection of hymn translations, Lyra Germanica Series 1, in 1854 or ’55, when she was still in her twenties. She followed with Series 2 in 1858. The church I attend sings a lot of hymns translated by John Mason Neale (1818-1866). That probably says something about the type of hymns we tend to sing, but it also says a lot about how prolific he was as a translator, and how much the English-speaking church owes him. The current Anglican hymnal, Common Praise, for instance, has no less than 25 texts translated by Neale. (Hymns Ancient and Modern had many more than that, judging by a brief glance at its index.) The old red Anglican hymnal, which my church still uses, has twenty. Over half of these are hymns marking seasons of the church year: Advent, Lent, and especially Easter. Hymnal: a Worship Book, used by Mennonite churches, has only eight, but one of those is “O Come, O come Emmanuel,” one of the essential Advent hymns. One result of the 16th-century Reformation was that Protestant churches began using vernacular languages in church liturgy instead of Latin. This was a good thing on the whole, but some things were lost in the process. 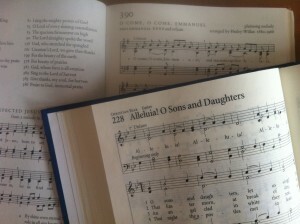 A great wealth of ancient hymns “henceforth became as a sealed book and as a dead letter,” as Neale regretfully put it. He did his best to remedy that, translating over two hundred Latin and Greek hymns from the early centuries of Christianity. I would guess that many people sing these hymns without realizing just how old they are. “O Sons and daughters” is relatively new, written in the 16th century, but “That Eastertide with joy was bright” dates back all the way to the 4th century. Thanks to these translations, English-speakers have access to hymns spanning over sixteen hundred years. Every era of church history has had its own “brand” of hymody, with its own particular emphases and its resulting strengths and weaknesses. The greater the variety of hymns we can sing, the greater the breadth of language and imagery that can inform and enrich our faith.